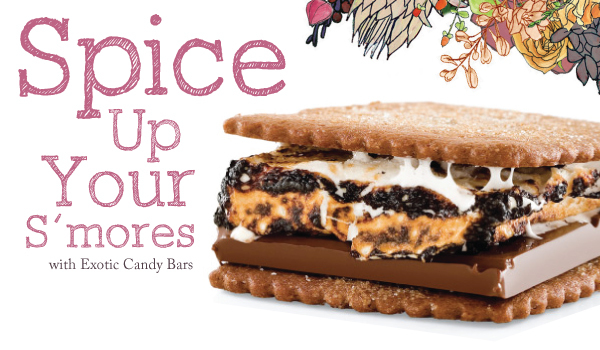 Exotic S’mores – Coconut, Bacon or Curry Oh My! Comfort food (in small doses) are part of SpaHome living. So when Vosges emailed this luxurious version of S’mores we had to share! Time to give the old campfire favorite a spicy makeover. Imagine how much better your S’more will be oozing with ancho & chipotle chillies, salty bacon or even curry & coconut! Toast your marshmallows to your liking – blush, bronze or burned. Place a square of any Exotic Candy Bar between two graham crackers. Ease your marshmallow on top of the chocolate and squeeze lightly to ooze the marshmallow out to the sides. Wait a few moments, if you can, while the warm marshmallow melts the chocolate. mmmm… ooooo…ahhhhh… I need some more! TO SWEETEN THE DEAL… Click here to buy 5 Exotic Candy Bars and the 6th is on us.